We know that Chin-Chin played in Calgary, Alberta on January 8th through the 10th, but don’t know where it played on the 11th thru the 14th. Possibly Saskatoon, they probably played in another city or two as well on their way to Regina. 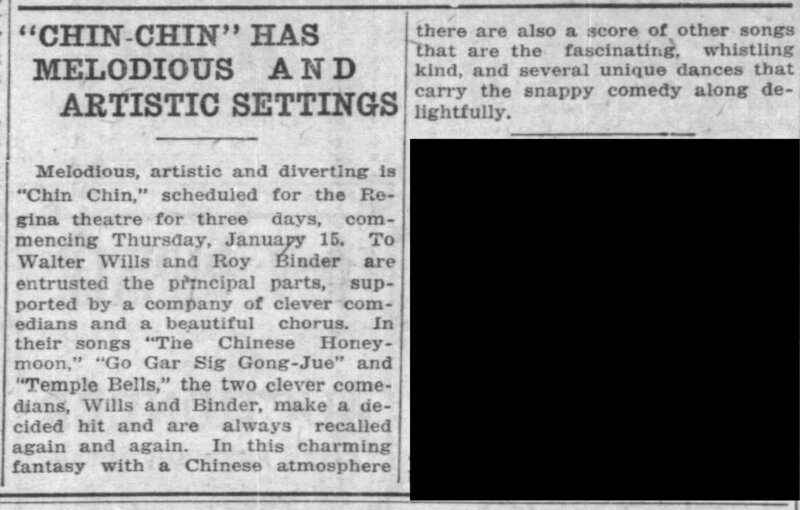 Melodious, artistic and diverting is “Chin Chin,” scheduled for the Regina theatre for three days, commencing Thursday, January 15. To Walter Wills and Roy Binder are entrusted the principal parts, supported by a company of clever comedians and a beautiful chorus. In their songs “The Chinese Honeymoon, “Go Gar Sig Gong-Jue” and “Temple Bells,” the two clever comedians, Wills and Binder, make a decided bit and are always recalled again and again. In this charming fantasy with a Chinese atmosphere there are also a score of other songs that are the fascinating, whistling kind, and several unique dances that carry the snappy comedy along delightfully. On January 9th, there was a standard “to the General Public” announcement similar to many of the “Chin-Chin” shows. On the 10th was a “What the Press Agents Say” article plus the first regular advertisements. On January 14th, the day before the show, the Regina “Leader-Post” newspaper had a very interesting article containing background information regarding the Arabian Nights tales. Charles Dillingham’s only company of “Chin Chin,” which comes to the Regina theatre tomorrow, Friday and Saturday, with a matinee on the latter day, with Walter Wills and Roy Binder in the leading roles is founded upon the most popular tale in the immortall eastern Saga book of the Thousand Nights and One Night, Aladdin or the Wonderful Lamp.” In fact it is frankly called a modern Aladdin, in which the two drolls disport themselves as a couple of Chinamen. Chin Hop Lo and Chin Chop Hi. Outside of the Holy Bible there is perhaps existant no more universally popular book than this same Arabian Nights, one of the best known English versions of which, is by the late John Payne, well known to scholars for his powers in English Verse. His translation of the poems of Mas­ter Francois Villon remain a monu­ment to his genius. read with eagerness by each successive generation, but nowhere are the tales read or listened to with greater delight than in the Arabian desert itself, where travelers record as a common sight, Sheiks and white-beards sitting gravely in their places at evening around the camp fire, women and children motionless as silhouettes outside the ring, all breathless with attention as they drink in the words with eyes and mouths as well as ears. while the Rawi or reciter. to whose wit the task of supplying details is left, entertains the groups with picturesque and oriental effect. 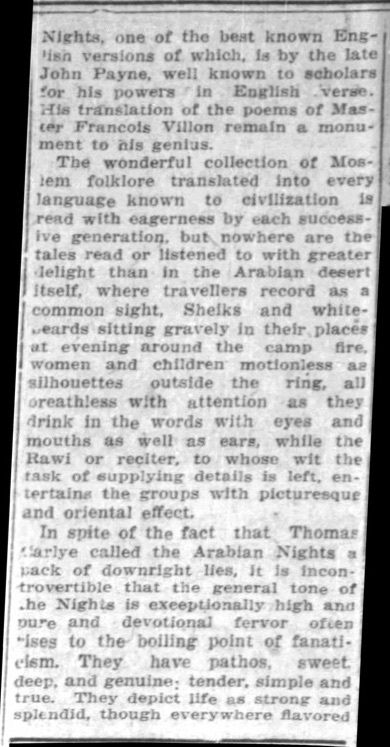 In spite of the fact that Thomas Carlye called the Arabian Nights a pack of downright lies, it is incontrovertible that the general tone of The Nights is exceptionally high and pure and devotional fervor often rises to the boiling point of fanaticism. They have pathos, sweet, deep, and genuine; tender, simple and true. 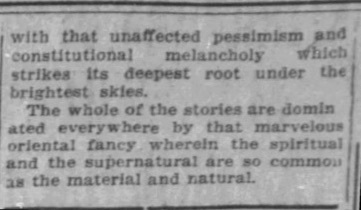 They depict life as strong and splendid, though everywhere flavored with that unaffected pessimism and constitutional melancholy which strikes its deepest root under the brightest skies. “Chin-Chin” continued east to play the Walker Theatre in Winnipeg, Manitoba, on January 19-24. 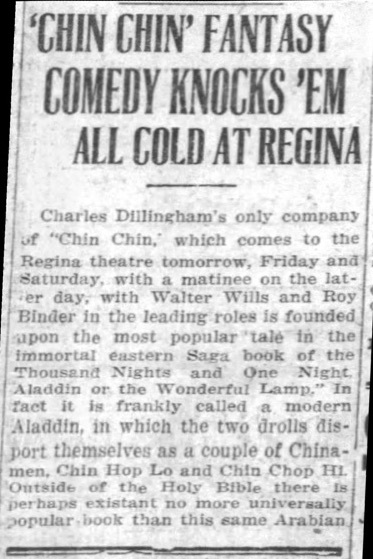 Once again, Donna played “The Goddess of the Lamp” in “Chin-Chin.” She was not mentioned by name in any of the Regina newspaper articles that I found, however, her role in the production was mentioned. 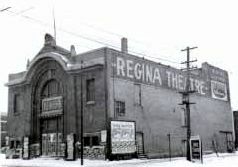 Determine the activities of the Chin-Chin cast immediately before and immediately after playing at the Regina Theatre. [ii] Source: The Cahn-Leighton official theatrical guide. (1913). New York, N.Y: Publication Office, New Amsterdam Theatre Building.